The spectacular pyramid show is a highly recommended watch in Cairo. You could attend the show with a guide or by yourself (which is a better option). 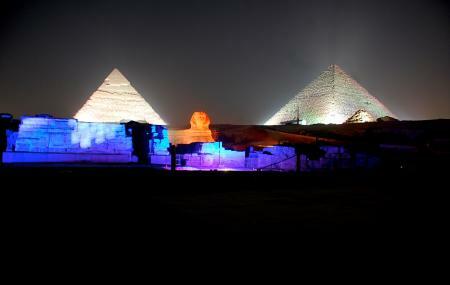 There is an entertaining light and sound show that’s put up at the Giza pyramids after dark. The narration of the pyramids gives you an insight to the history of the gorgeous pyramids. The pyramids are the show of Egypt, don’t miss a thing about them on a visit to any part of the country. There are shows in various languages as well. Visit the official website or call for price details. Timings will differ with shows. Visit the official website or call for timings. How popular is Pyramids Show? People normally club together Mikerinos Pyramid and Coptic Church Of St George while planning their visit to Pyramids Show.